As a quilter and business owner, finding inspiration and other quilters to connect with can make a huge difference. Today’s post is a guest post by Heather, a longarm quilter who is sharing where she finds quilting inspiration. Starting a machine quilting business can be a lonely enterprise, especially when you are just starting out. There is no way around it – starting a business is hard! There is probably a lucky person out there with the “Dread Pirate Roberts” scenario that was able to purchase a longarm (or sewing machine) and inherit a customer list from a retiring quilter, but for the rest of us it’s a process. A process that can be made easier, or at least more enjoyable, with the assistance of a mentor or a few friendly supporters along the way. While I love quilting, and that it helps me stay at home with my daughter, I also miss the human interaction from my former life in the daily office environment (never thought I would say that when I left!). Listening to my daughter’s picnic basket toy sing “I’m bringing home a bumble bee” for the 37th time that day is just not the same. I’ve tried several different activities in search of adult interaction and creative stimulus, and as they say – Results may vary. In conventional wisdom, guilds are a great place to share your work and get your name out as a machine quilter while gaining inspiration and learning from other quilters. But sometimes, it can be hard to find a good fit. I’ve personally been challenged to find a quilt guild to call home. Recently, I joined a local quilting group, only to find out after my membership check cleared that my daughter was NOT welcome at their meetings. I’m not giving up yet though – there is a Modern Quilt Guild north of me that will hopefully be a little more understanding if I can’t find a babysitter one month. Reaching out to local quilt shops can be a good way to find a mentor or inspiration. 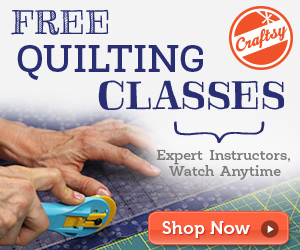 My local quilt store doesn’t really encourage promoting machine quilters because they run a machine quilting business themselves. (Despite having a two month wait to quilt a baby quilt, they are very protective of that piece of their business because they don’t want more competition in the area.) The good news is that is not the case everywhere. For instance, when I started quilting in Missouri, the local shop hosted a Standup Stitchers group and rented time on their longarm machine. Their perspective was that any increase in quilting activity was good for their business, and I wish I still lived close enough to take advantage of the community they created there. Online Forums: There are Yahoo Groups for Machine Quilting in general as well as for individual brand machines. This can be a great way to meet other people with your same machine and get opinions and information. The advantage of yahoo groups is that you can get a daily digest email with all new posts so that you can see what is being posted without having to routinely visit the website. Most quilting companies also run forums on their website that can be a fantastic source of inspiration and information if you spend the time to look through them. Online Bees: When you don’t have a local quilting community, that doesn’t mean you are alone. I’ve joined two piecing bees this year (Stash Bee and the 4×5 Modern Bee) and I love the inspiration it is providing me. I’m “meeting” quilters all over the country and the world. I’m using colors and techniques that I wouldn’t have tried on my own. The best part for me is that as I am making their blocks I start thinking about how I would quilt their finished top, and it gives me more ideas for my customer’s quilts. As I continue to search for even more inspiration and interaction, I wonder what ways have you tried to find a creative community or mentor? Margaret, You do amazing work and I love seeing what you are working on. Thank you for sharing your work on the blog! My daughter has that same picnic basket, now that song will be stuck in my head ALL day! Thanks for your inspiring tips, now I am ready to go quilt a couple quilt tops that have been in the stack for awhile. Those songs get stuck in my head too! I’m going to be 80 and still have that song memorized. Good luck with starting your quilting venture!